From building sets to delivering performances, learn what it takes to bring a production together. Registration is open to campers from 14 to 18 years old who have just completed or are entering into grades 9–12. Focusing on the fundamentals of performance, Drama Camp provides hands-on experience, focusing on areas such as acting, stage combat, costume and makeup, staging, and scenic design/construction. You’ll see firsthand what goes on behind the scenes and experience the technical processes involved in a production. Experienced Pensacola Christian College speech faculty will give group and individual instruction, as preparations are made for a showcase in the PCC Experimental Theater. Family and friends are invited to attend this special event. Registration closes Wednesday, June 27, at 8 a.m.
During this week, we’ll all celebrate America together with themed activities! During this week, we’ll all celebrate America together with themed activities! Daily activities include acting, scene preparation, and training in technical aspects such as costume design, makeup design, sound, lighting, and scenic design. However you spend your free time, you’ll be spending it with your newfound friends. You can explore the Sports Center—climb the rock wall, bowl with friends, cool off in the ice skating rink, or make a splash at the water park. You can grab a smoothie at the Common Grounds Café and just hang out. Each day, chapel will be a time to come together and grow spiritually. You’ll audition for acting roles on the first day of camp, so bring a 1- to 2-minute memorized reading from literature (poem, story, or essay). Mrs. Ashley Webb finished her undergraduate degree for speech education in ’09 and her master’s in speech education in ’11. She has worked as a camp counselor/staff at the Bill Rice Ranch for 6 summers and as an instructor for Drama Camp two summers. She was able to take her passion for camp and drama and combine them when she became director over Drama Camp in the summer of ’16. 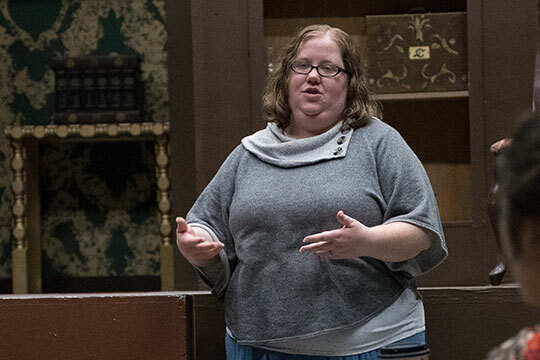 She has a passion to not only bring fun new ideas to her students at camp, but also to help them become stronger performers after their performance at camp. She loves teaching, and getting to make sure that everyone not only learns, but gets to have a great time, is one of her greatest passions. Matt Teis pastors at Liberty Baptist Church and has a heart for youth ministry. 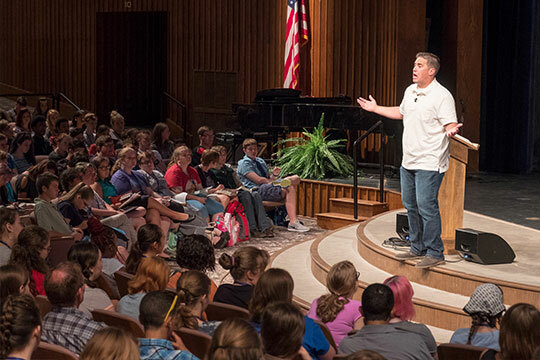 His passionate, captivating style makes each message memorable for the campers. Find out more about camp, activities, and accommodations.